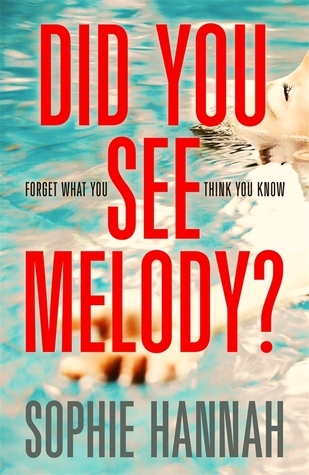 A somewhat strange psychological thriller, Did You See Melody? by Sophie Hannah mixes two totally separate stories into one big mystery. Cara Burrows is a hard working mother to two teenagers, always running around after them and her husband, Phil. However, enough is enough and she’s tired of being taken for granted, especially when she’s discovered that she’s pregnant again and no-one else in the family wants her to have it. In a very drastic move, she empties a proportion of their savings account and takes herself off to a five star resort in America, intending to relax and sort her head out before returning. After a long flight and journey to the resort, all Cara wants is a bed, but her wish is disrupted when the receptionist sends her to the wrong room. Instead, she walks in on a man and his daughter, who looks around thirteen but talks in childish language and is attached to a toy called Poggy, a strange pig-dog hybrid. Apologising profusely, Cara leaves the room and is sent to another, thinking no more of it. However, the next day she hears that the police have been called, with an elderly lady claiming to have seen Melody Chapa, a girl who went missing several years ago. Her body was never found and her parents are in prison for the crime, with there being nationwide news coverage and a host of interviews and theories thrown around on TV. Being from the UK, Cara is none the wiser and has never heard of the case, but her curiosity soon gets the better of her. 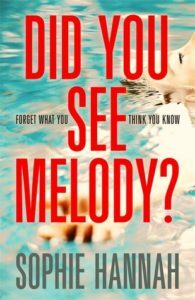 As she digs a little deeper she starts to believe that she saw Melody that night, but what she knows could put her in more danger than she realises. I really enjoyed seeing this mystery unfold, as the narrative is interspersed with news articles and TV interviews from the past, so we can see the case developing in both past and present. In both instances it is easy to question the innocence of all involved, as it is never quite clear who is responsible for Melody’s disappearance and whether or not she has been killed. The TV specials are orchestrated by the presenter to target certain individuals, with you wondering if they really are guilty or if it is purely being projected onto them by the media. As an outsider, Cara is making discoveries with the reader, enabling us to relate to her curiosity and her desire to know the truth. However, part of this felt somewhat unrealistic, as she is a complete stranger from another country who thought she saw something, not actually having any real connection to the case. It seems unlikely that she would become so attached to it, and that this is purely a distraction to keep her from worrying about her pregnancy. She is the only character we can form a connection to in the book, as the others are not developed at all and are defined by their role in the case rather than by any presence of character. It is only Melody that we learn anything about, via first person diary entries from her childhood and others’ accounts of her life. There is always a distance from her, meaning you are never sure how much is truth or fiction, and whether we are being lied to as readers. This does help to add suspense, and I was keen to find out the truth behind what had really happened to Melody, but it is easy to feel detached. I found that I had some problems understanding Cara as a character, as to run away to an American resort seemed like an extreme step to take just for some time to thjnk, and her reaction when reunited with her husband is to run away again. At times it seemed like the author was trying too hard to make Cara a part of this mystery, and that made it difficult to appreciate some of the twists to the case. Although I was interested enough to find out what happened, I was then a little disappointed by the ending, as in trying to give a final psychological twist we are instead left with uncertainty about everything else we’ve read thus far. This did not work for me, but on the whole I found the book enjoyable and easy to read. An intriguing mystery which drags an unsuspecting Brit into an all-American investigation, this book has a different set up which aids the build up of suspense. The story is gripping and easy to read, attempting to play with your mind and what you think may or may not have happened. Although I wasn’t enamoured with the ending or some of the character development, I still thought this was a great mystery read for fans of the genre looking for something a little different.